I wanted to provide a quick update on our visit to the IWA Outdoor Classics show in Nuremberg, Germany, our first time at this show. I had a great time over there and met so many interesting people. The language barrier was a bit of a hindrance as this show draws a good share of visitors from five European countries surrounding Germany. But hey, hunters are hunters, and collectors are collectors, the world over. For being our first time in Europe, it was fascinating to have three to five people a day come up to us who knew us and were familiar with our work. What makes this so interesting is that we have not really penetrated the European market much because there is a huge disparity in gun laws among the countries that governs what and how many firearms a person can own. One of our roadblocks as a company is that we can’t sell direct so any sale needs to be orchestrated through an exporter and importer, with a myriad of paperwork throughout the process, which can add considerable cost. So we learned a lot each day about the various laws that govern collecting and hunting. One of the things we learned from hunters from France is how huge a sport pig harvesting is. It’s like deer hunting for us here in the States. We also learned how jealous the Europeans are of us Americans in that we can own a variety of and numerous firearms and the vast opportunities we have for hunting. The Europeans definitely have a big interest in the lever action rifles, the single action revolvers and the entire “wild west” theme. There was also considerable interest in both our restoration work and manufactured “vintage” firearms. Although the Nuremberg show was a bit expensive to participate in, we do plan on returning to IWA next year. I think it will take us a few years to get established in Europe and build our relationships. In the meantime, we can start planning on how to streamline the necessary processes to easily enable our European friends to … shoot history! Oh and yes, Nuremberg was a blast (in spite of our limited free time there). 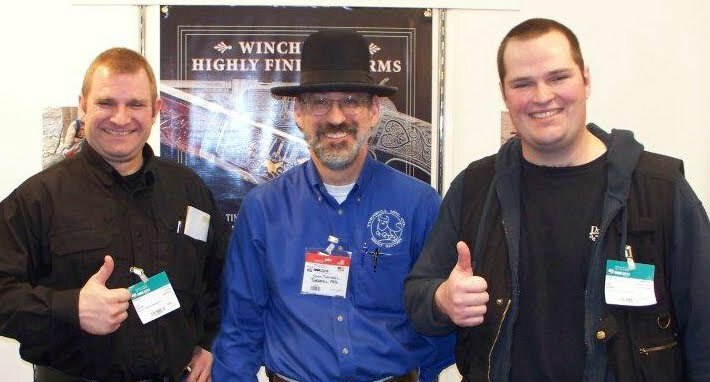 While I talked to thousands of avid gun collectors and hunters at the IWA show a few weeks back, we were surprised, amazed and grateful for a visit by two brothers from the Netherlands whom we have done business with several times, but never actually met. So when they read online that we were coming to the IWA show, they decided it was time for a meet and greet, and drove six hours from Holland to Nuremberg to visit us. Needless to say, I was honored. Like us, Stef and Clark Sindorf know all about quality restoration work, and taking something old and making it better than when it was built new. Their niche – heavy construction equipment. And like you and me, in their free time, the Sindorf brothers like guns – both collecting and for hunting. They particularly like restored rifles from the late 1800s with new barrels. They want the old look but with modern ballistic performance. For the Sindorfs, there is another driving factor in their gun selection criteria – Holland’s gun laws. Firearms that pre-date 1898 are not regulated as more modern firearms are, and as such, a person can own as many as they want. They followed up our IWA visit with an e-mail regarding their latest purchase with this quote. They truly love the guns we have provided them and getting to talk with Stef and Clark in person was a great occasion for us. Shoot history guys!